Born on 22 April 1917, Sidney Nolan’s centenary is less than two years away. So far I’ve heard of no plans to mark the occasion with an exhibition or otherwise. 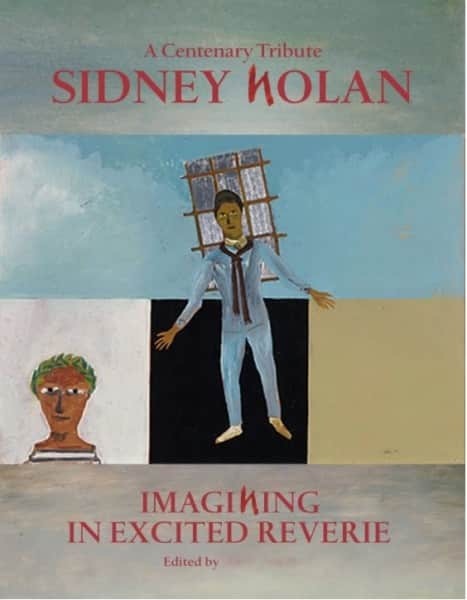 If this is indeed the case, here’s a suggestion that someone might like to take up: a 2017 symposium and the publication of a book of essays A Centenary Tribute, Sidney Nolan: Imagining in Excited Reverie. A mock-up cover follows. Mock-up for cover of proposed Nolan centenary tribute book. The painting is Nolan’s 1948 “Orphée”, collection NGA. In 1965 Sidney Nolan painted the cover for a centenary tribute to W. B. Yeats, one of almost eighty Nolan book covers. The book’s title In Excited Reverie is from a Yeats poem. A major publisher and a major art institution could cooperate to publish the collection of essays and stage a major Nolan symposium, with recognised Nolan experts presenting papers underpinning the publication – ideally to be launched at the symposium. The enterprise would be relatively low cost. For the publisher, costs of publication should be less than average and with sponsorship, the venture should be revenue neutral at worst. For the art institution, costs of a symposium are small in comparison with an exhibition. Earlier this year the National Gallery of Australia ran a symposium on The Legacy of Hugh Ramsay – if Ramsay, surely also Nolan in his centenary year. If held at NGA, established sponsors would most likely vie to underwrite costs for a Nolan Centenary venture. Perhaps AGNSW would loan First Class Marksman to enable a rehang of the 1948 Velasquez exhibition of Nolan’s first series Kellys. Combined with Riverbend from ANU’s Drill Hall Gallery, this would be a low cost Nolan Centenary exhibition of historical significance featuring, arguably, his two greatest works. Centenary essays paying tribute to Nolan could be sourced widely within Australia and beyond, and be written not only by acknowledged experts but by relative newcomers to his art, by some who knew the man and by some born after he died, by some from the world of art and by some far removed. All would examine the author’s personal involvement with either Nolan or his work and how it informs their view of this best known Australian painter of the 20th century. Each writer could look at Nolan’s life and work from their own perspective – whether curating in excited reverie, filming in excited reverie, visiting, living, loving, discovering, collecting, writing, wandering, wondering in excited reverie, and so on. The essayists could be from the likes of directors, curators, art historians, writers, and others from across the professional divide – artists (in the 1980s Barbara Blackman did a series of oral histories with many artists, most of whom had their take on Nolan, and these could be drawn together), collectors, gallerists, auctioneers, friends – and, one hopes, family. All we now need is a publisher, an editor, a gallery, a curator and a sponsor. Any takers? I nominate one David Rainey to be a part of any such venture,and certainly to be a leading contributor to any such publication. And if the symposium/exhibition is to be at the NGA then let’s hope that that stupid round room currently used to hang the Ned Kelly works is demo;ished and a more sympathetic space is given over to hang the works. Thanks Peter. I think the Kellys work quite well in their oval room, though I know others who agree with you. I wonder how they were hung in 1948 at the Velasquez Gallery. Perhaps there are photographs, but I’ve never seen any in the archives. Maybe Jean Langley can recall. She looked after the show during the lunch hours and writes about it in Warwick Reeder’s 1997 catalogue – but she gives no details of the hang. Can anyone help? To celebrate his centenary, on 30 March 2017 Australia Post issued a new $1 stamp featuring Nolan’s painting “Footballer” 1946, and a photographic portrait of Nolan by Axel Poignant. The idea of a symposium at the NGA is perfect. They’ve done Ramsay recently, and a good, much more informal Tom Roberts study day. As you say, they could easily get the Kelly ‘set’ together; plus Riverbend. They could involve the ‘Lanyon’ pictures too – now at the Canberra Museum & art Gallery and often forgotten. The publication is a great idea too – either separately or as a result of the symposium.